Bagheera the Diabetic Cat — Page 521 of 523 — I am a bengal cat who was born in 2005. In the summer of 2012, I was diagnosed as a diabetic cat. I want everyone to know that diabetic cats like me are just as fun and loving as cats without the disease. In order to help you humans learn more about diabetic cats, I am going to introduce you to some other cats who are fighting diabetes like me. Today, I would like to introduce you to Clyde. Clyde is a polydactyl diabetic like me. He is a mature cat, and turns 15 on April 7. He didn’t get diagnosed with diabetes until he was 11 1/2. He went in for his senior exam during the summer, and everything looked great. But then his human noticed that he was urinating a lot. He was going so much that instead of absorbing the urine, the litter would just puddle. 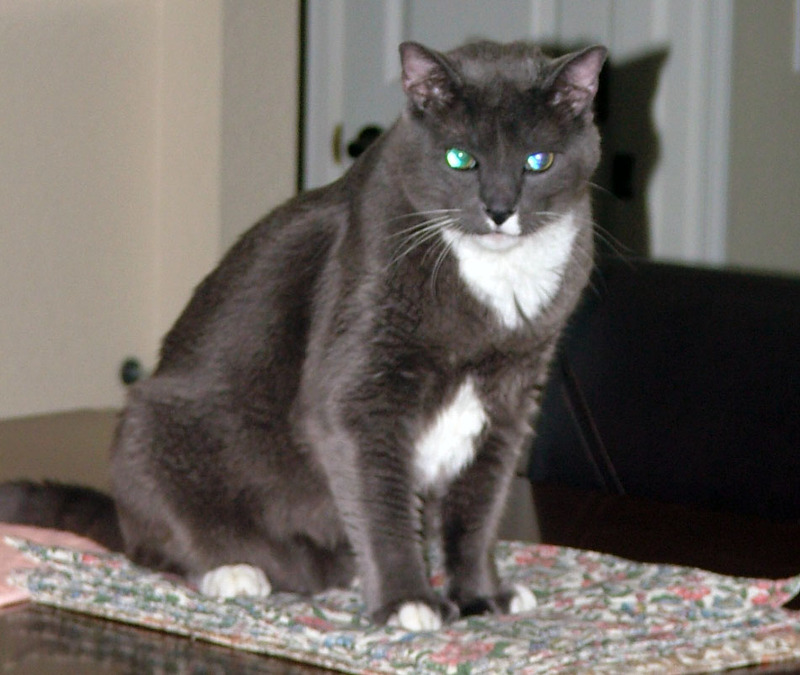 Clyde’s human had to play detective, because Clyde was living with his litter mate Bonnie, a feral rescue named Simon, and a cat named Nellie who crossed the rainbow bridge last summer. But Clyde’s behavioral changes made it easy. Since Clyde had to go so much, he started going outside of the litter box. And he started to lose weight, dropping two to three pounds very quickly. His human was worried, and took Clyde to the vet in September, just a few months after his last visit. A new blood test showed that he had diabetes — his glucose readings were off the chart! The vet prescribed pills for Clyde initially, hoping that this would get the glucose under control. Clyde, however, had other ideas. His human says that Clyde is not one who likes taking pills. Plus, they had no effect. So Clyde’s human decided to go to insulin, specifically Humulin N. His human’s vet had some good results with this insulin, and they hoped that Clyde would react well, too. Initially, the insulin worked well for Clyde, and he would be tested a few times a week and the dosing adjusted accordingly. The lucky guy didn’t have to deal with two ear sticks a day like I do! Unfortunately, despite the initially positive results, poor Clyde has never been what you would call well regulated. For a few months his glucose readings are under control, and then they crash, so his human has to stop dosing him. Then they spike too high. But his human is persistent, and observant. She has learned to tell by Clyde’s behavior whether his blood sugar is too high, or too low and then she takes him to the vet for testing and a dosing adjustment. Clyde has had a problem with urinary crystals throughout his long life, and his human doesn’t know if that’s related to the diabetes. And his litter mate Bonnie, who is not a polydactyl, hasn’t faced the same challenges as Clyde. But despite his challenges, Clyde is a loving and affectionate cat. He loves to lay on his human’s couch with his two canine friends, who are Labradors. So Clyde has different challenges than I do. But just like me, he is a loving and affectionate cat. We require more work than most cats, but for the right human, we make purrfect pets!